Veg-Wich, New Food Truck in Seattle! 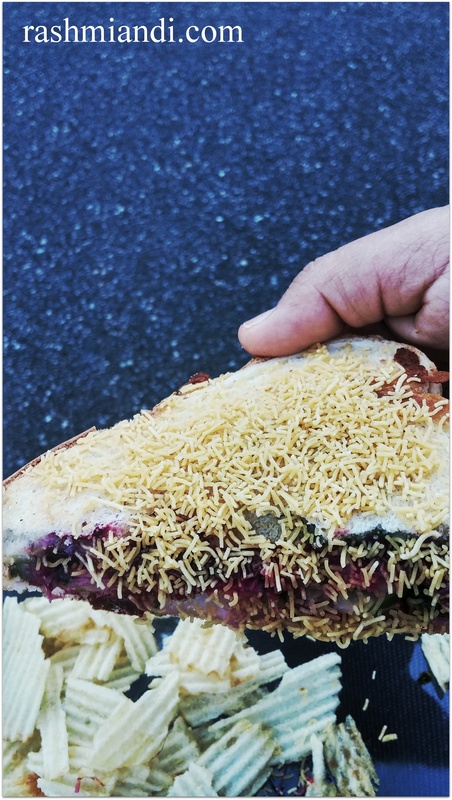 Last week on Friday we had Veg Sandwiches(Bombay style) after a very long time. Anil found out, about this place through social media.Well as major foodies, we both didn’t want to miss an opportunity of trying these new Veg Sandwiches. 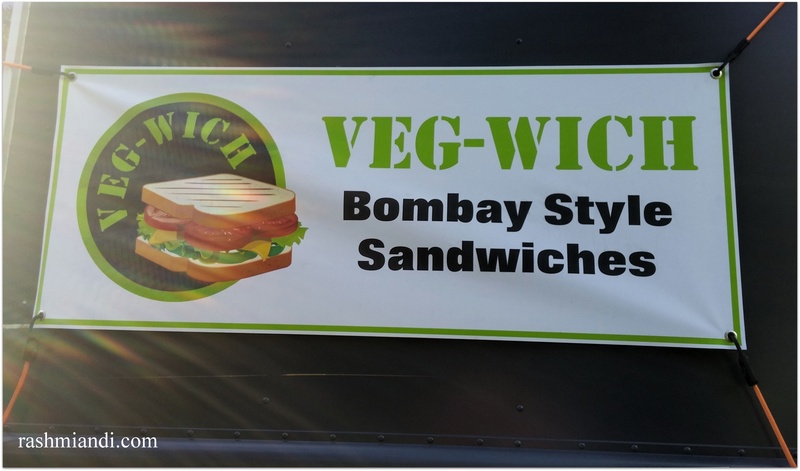 Veg-Wich is a new Veg Food truck in town. Its a grey food truck. Its easy to spot since they are active on social media. If you like their veg-Wich page on Facebook you can get more updates as to where you can find them and their Menu. On that day their Menu looked like this. I went ahead and ordered Bombay Club Sandwich and Anil ordered an Aloo Masala Sandwich. It was 7.5$ each. They had other options too such as Paneer Masala and Cheese Masti. All Sandwiches were priced at the same price(7.5$ each).They also had Water,Pepsi, Coke and Rooh-Afza priced at a Dollar each. The wait time was around ten minutes which wasn’t bad at all.The staff was very friendly and helpful. This is how we got our Sandwiches with a side of chips. Even though our order was for here,they were kind enough to give it in a box with some chutney.You can add sauce if you wish to. 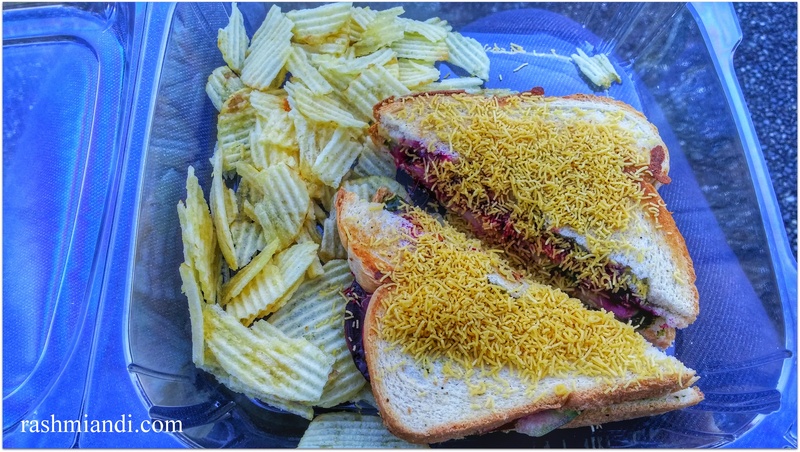 Story of the First Bite: Bombay club had a lot of veggies in it,such as Beets,Peppers,Boiled Potatoes, Tomatoes and Cucumbers along with Cheese, butter and chutney.The sandwich was cut into two triangular halves, topped with Sev. So there was kinda crunch to every bite outside and soft and rich with lot of flavors from vegetables inside.The sweet flavor of the beets just made the sandwich heavenly.I could taste the beet in every bite along with cucumbers which brought the freshness to the sandwich.Just the right amount of salt and spice from chutney made the sandwiches more enjoyable. Anil loved his sandwich too,next time will try others so that I can let you know how they were! 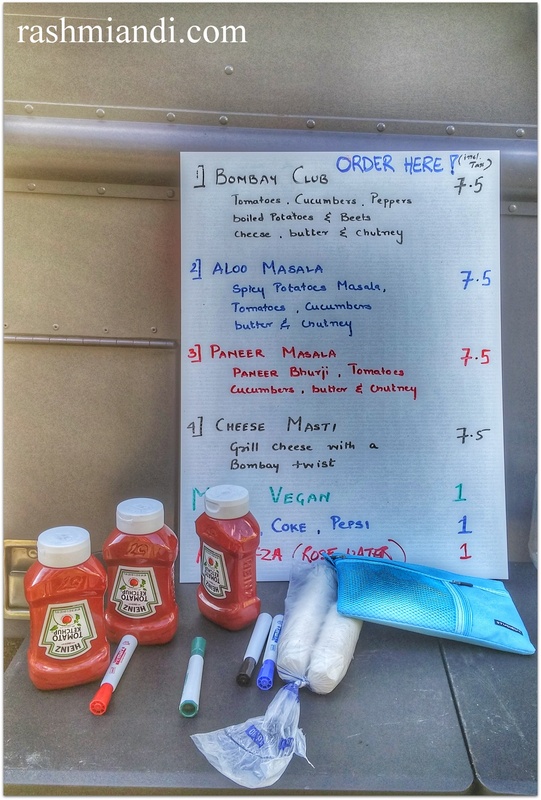 Story of the first bite- Bombay Club Sandwich! Enthusiastic people together with some interesting Aamchi Mumbai Sandwiches. All vegetarian is the next best part of the story. Not much of a wait time,they were Fast,neat in presentation and tasty too. Bombay Club which I ordered was one of the very good sandwiches which I have had off late. Do try these yummy sandwiches! Your Welcome,feel free to share it on your page!